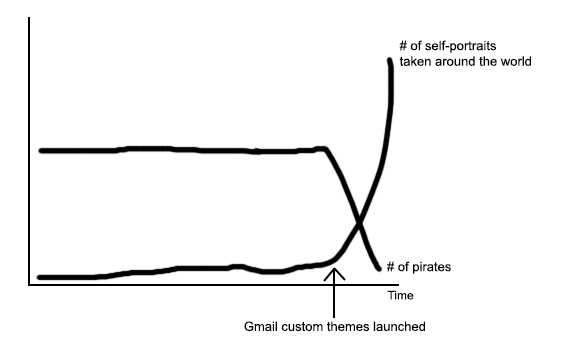 Today, Gmail hits the double digits. Over the last 10 years, you—our users—have been our biggest inspiration. You've sent us ideas for features you want, and told us what you like (and didn't like...). So while it may be our birthday, we want to say thank you to you with a gift that is, well, all about you. When custom themes launched back in 2012, we urged you to find “your perfect image and make Gmail your own.” And you did. Many of you rushed to take photos of yourselves to upload as your Gmail custom theme, which you started referring to as selfies. As you undoubtedly recall, this term quickly spread beyond email themes and has permeated our culture so thoroughly that the Oxford Dictionaries named it Word of the Year in 2013. You all love setting selfies as your custom theme in Gmail, but you’ve told us there’s one major problem: there isn’t a way to share your selfie with others. As the pioneering platform for selfies, Gmail is committed to being at the forefront of innovation in the selfie space. And we think it's a tragedy that your handsome hair, luscious lashes and beautiful brows have been trapped in your own inbox. Until now, that is. Today, we’re proud to free your selfies by launching Gmail Shelfie, the SHareable sELFIE. Got an awesome selfie? Upgrade it to a Shelfie! Simply open or refresh Gmail on the desktop and share it with your friends. If you're looking for inspiration, set your theme to Gmail's top trending Shelfies. You can also see who's currently trending on our Google+ page. Spoiler alert: Word of the Year 2014 will be Shelfie... clearly.